2017 was a year of growth and development not just for PFERD, but for the communities we serve. We took part in numerous events with a mission of sharing knowledge and building excitement around the US manufacturing sector. Throughout the year, we donated time and materials to students interested in welding and other industrial professions. In February we donated products and prizes for Sequoyah High School’s 8th Annual Welding Competition. The event was hosted by the American Welding Society’s Chattanooga Section and featured dozens of student entrants. We also sponsored a SkillsUSA WorldTeam welding competitor, who placed 5th overall in the event. The WorldSkills Competition took place in October in Dubai, and a team of 11 US competitors from around the country participated, bringing home four Medallions of Excellence. Our support of youth in the manufacturing sector also meant hosting a Manufacturing Day event on October 6th. We had about 120 students attend our open house and career fair to learn about our different departments and opportunities. They also got to use some tools – with proper safety precautions! While extensive efforts are being made to recruit young people in the manufacturing sector, the skills gap remains a challenge. There’s the added challenge of showing young women that they can have rewarding careers in the industrial world. 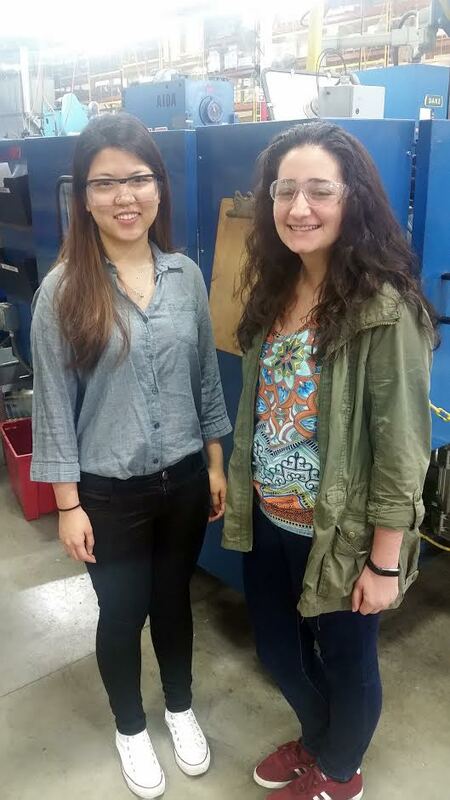 Over the summer, we hired two female engineering interns to assist with key engineering projects including designing tooling molds and identifying methods to increase production efficiencies on the shop floor. Both interns added value to our team, making strong contributions during their time at PFERD. Toward the end of 2017 PFERD was busy preparing for and attending two major events – FABTECH and the PRI Trade Show. The 30th annual Performance Racing Industry (PRI) Trade Show was another high point in our year. We met with fabricators and other professionals in the racing industry to highlight our offering to this market and introduce product lines that fit well for this production niche. As we begin the next chapter in 2018, we’re already looking forward to new opportunities for growth. Keep checking back to see what we have planned for the year ahead. And if you have any ideas for how we can get involved in your projects, let us know! Every October, the industrial sector comes together in support of Manufacturing Month. This time of year is filled with open houses and informational sessions to get people interested and excited about the role of manufacturing in the United States. On October 6th, we celebrated National Manufacturing Day by inviting local middle and high school students to PFERD’s manufacturing facility. This Manufacturing Day, we had about 120 students take part in our open house and career fair. All of the students involved are already enrolled in STEM PLTW (Project Lead the Way) coursework, so this gave them a further look at real-life applications for the concepts they’re learning about in school. During our Manufacturing Day event, students were able to talk to representatives from different departments at PFERD to learn about what they do each day. They were taught about our business as a whole, the educational backgrounds of some of our workers, and the many opportunities that are available to people within the industrial sector. Getting to meet with actual employees and ask questions about their work allows young people to get a more comprehensive look at the different roles within a company. The students also got to participate in hands-on sessions using some of our tools, including files, wire brushes, and non-woven finishing products. They even got to use some power tools – but no sparks! Safety always comes first, and we made sure to get that point across, too by handing out safety glasses and demonstrating the proper way to put in ear plugs. We gave our visitors a plant tour and showed them how our wire brushes are manufactured using automation and other new technologies. From processing and finishing, through logistics and warehousing, we provided a well-rounded experience. As a North American manufacturer and supplier of premium finishing tools and abrasives, PFERD is always looking for fresh talent to move our company forward. Building off a 200-year history, we understand the importance of keeping up with the times through new technology and ideas. For this reason, it’s vital to continue the tradition of attracting young people to this field. By hosting annual Manufacturing Day events, we expose the next generation to the diverse career options available to them. Get “Down and Derby” with PFERD at FABTECH! From November 6-9, 2017, PFERD will join thousands of fabricating /welding exhibitors and attendees at FABTECH 2017. The event will take place at McCormick Place in Chicago, and brings together suppliers and industry professionals looking for the latest metalworking products and technologies. Stop by PFERD’s booth, B17025, located in the North Hall. As a top manufacturer of metal cutting and finishing products, PFERD will have representatives on-site to introduce attendees to our innovative range of solutions. But we also wanted to raise the stakes this year, and build more excitement around the event. To do this, we’ve launched the PFERD DERBY app for participants! PFERD DERBY is a web-based app where players accumulate points based on successfully completing challenges we’ve put together. To sign up, attendees can link their LinkedIn accounts through the online app, or create an account separately. To encourage participation, each person who signs up will automatically win a prize! Sign up ahead of time, or while at FABTECH by going to pferdusa.com/derby. All you have to do is stop by our booth, show us that you’ve signed up and we’ll award you a participation prize. around our booth at the show, by interacting with booth personnel and within our social media posts (so be sure to follow us online and check our posts frequently for updates!). Participants should search for the #PFERDDERBY hashtag on Twitter, and strike up conversations with our staff obtain the passcodes and compete for the highest score! We’ll have an in-game leaderboard in our booth to track your progress against other participants in real-time. By the end of FABTECH on November 9th, we’ll award prizes to the players with the top 3 scores. If you win but are not present, we’ll follow up with you to ensure you get your well-earned prize. For additional details including game rules, terms and conditions click here. We look forward to seeing you at the show and working with you to complete the PFERD DERBY challenges. If you have any questions before the show, details can be found at pferdusa.com/. Do You Know the Oldest, Family-Owned File Manufacturer in the World? Very few manufacturing companies can say that they have more than two centuries worth of experience. Even fewer can say that they’re still family-owned, and continue to offer the products that brought them success all those years ago. In fact, PFERD is currently the only manufacturing company in the world to claim this distinction! Though our product lines have grown considerably over the course of 200-plus years, we have continued to manufacture the items that started it all – farrier files. For those who are familiar with German, you may have noticed that our company name, PFERD, is German for “horse.” This is no accident – among our first products were files designed for farriers to maintain horses’ hooves. Since then, our file product line has grown considerably to include wood rasps and files, machinist files, key files, car body files, and more. Our hand files and accessories are used in a variety of industries, from aerospace manufacturing, to pipeline development, to nuclear energy, and more. But among all of these additions, horse hoof planes and horse rasps are still among our featured products. But choosing the right file for your job isn’t necessarily as easy as it sounds. For unusual or challenging applications, we’ve created a product selection guide that takes into account the general application and materials to narrow down which type of file will work best. We’ve also developed exclusive product ranges for specific applications. For stainless steel and exotic alloys, CORINOX® files are recommended since they leave no corrosive residue on the workpiece and resist loading. They have a surface hardness of 1,200 HV (Vickers Scale), 70 HRC (Rockwell Scale), and have a long service life. We also have an exclusive line of diamond needle files, in which diamond grit is electroplated onto precision-forged and ground file blanks. Diamond files are ideal for hardened steels and other hard metal components when it comes to cutting, punching, press/extrusion and profiling dies, as well as for filing workpieces made of glass, ceramics, and fibre-reinforced plastics. In addition to offering these exclusive products to our customers, we also provide packaging and merchandising assistance for our distributors. We understand that a diverse product range can be confusing if you don’t know exactly which type of file you’re looking for, so we try to make things easier for retailers and customers alike. As a leader in file design and manufacturing, we’re happy to find the right solution for your needs. If you have any questions, feel free to call us at (262) 255–3200 or email sales@pferdusa.com. We look forward to hearing from you! With the current skills-gap looming over the heads of just about everyone in the manufacturing sector, it’s clear that something has to change. Industrial companies need to widen the net to find talent. For many, this involves offering apprenticeships and internships to students. It also means opening the doors to more women in this field. In an effort to widen our recruitment efforts, PFERD has been offering internships to college engineering majors. This summer, we were proud to onboard two female engineering interns. Here are their stories. From a young age, Vanessa has been interested in engineering, taking classes throughout high school. Her teacher encouraged her to pursue mechanical engineering, and she hasn’t looked back since. Here at PFERD, Vanessa works with other interns and engineers to design structures that will make production more efficient, as well as re-designing molds to make the brush making process faster and easier. Back at school, she has her hands full with a number of leadership roles: She is the Philanthropy Chair for Alpha Omega Epsilon- the engineering and technical science sorority, where she organized and led a fundraiser to donate to The Girl Effect; she is a chartering member and Vice President of fellowship for Alpha Phi Omega, the service fraternity; she is a member of the SAE Baja team to design, build, and race a baja car against other teams across the country – and she was the first female driver for one of Marquette’s cars this past winter; she was also a teaching assistant for the general engineering class for freshman engineers. Ji’s first introduction to engineering took place in high school through the FIRST Robotics competition, in which she competed on a team. From there she has continued to learn and grow as an engineer. Her biggest accomplishment thus far actually came while interning at PFERD. She’s also been able to learn a lot about working internationally. Coming from South Korea originally, she’s been able to immerse herself in American education and manufacturing, learning the nuances of our language and culture. “Throughout my internship experience, I have been learning a lot everyday not only about engineering but also about the professional work environment,” she said. As a leading manufacturing of cutting, grinding, and finishing tools, PFERD is proud to work with the next generation of design engineers and help them perfect their craft. Even now, their talent is obvious, and we are excited to see what they produce in the future.